Your door is the first line of defence against criminals. A secure door lock is crucial to keeping burglars out of your property, and your belongings safe within. But with so many different types of door locks to choose from, figuring out which is the best for your home can be difficult. At Banham, we sell door locks of two main types: mortice locks and rim locks. Every one of our Banham door locks is accredited by Secured by Design, the official UK Police flagship initiative combining the principles of “designing out crime” with physical security. Most Banham door locks comply with BS3621, which is the industry standard for locks on external or entrance doors accepted by the Association of British Insurers (ABI). If you’re looking to improve home security, which could help you save money on home insurance, it’s important to get the right locks fitted. To find out which locks would best suit your property, get in touch for a free security survey. If you’d like to learn more about locks, read on as we break down the types of door lock, and which of them is the best choice for safety-conscious home and business owners. What is the difference between a mortice lock and a rim lock? Whether a lock is described as a mortice lock or a rim lock depends on how it is mounted to your door and frame. A mortice lock is one that is fitted inside the edge of the door. Mortice lock cylinders are inserted into a hollow, or ‘mortice’ in a door’s edge and a strike plate serves as the lining for a recess in the frame into which the bolt fits. Mortice locks are difficult to force open as most of the lock mechanism is secured within the door frame. Some home insurance policies stipulate a home must use a mortice lock in order to meet compliance with the terms of cover. Mortice locks are also more aesthetically pleasing, as less of the locking mechanism is visible. Only the keyhole and faceplate are seen when the door is ajar. A rim lock is a lock that is mounted on the inside surface of a door. The lockbolt and key cylinder mechanism are contained within a lock mechanism fitted to the door itself, sometimes called the ‘nightlatch’. When in the ‘locked’ position, the lock bolt is caught in a keeper that is mounted on the inside surface of the door frame. This means rim locks are only suitable for inward-opening doors. Since rim locks do less damage to the woodwork when fitting, they are often the lock of choice for heritage or listed properties. Some rim locks can be unlocked using an electric release mechanism, which remotely releases the lock bolt from the externally mounted keeper. Our EL4000 Rim Deadbolt uses an electric release mechanism, making it suitable for use with flats or properties with shared access entry systems. What is the difference between a cylinder lock and a lever lock? There are two main types of locking/unlocking functions for both mortice locks and rim locks, known as lever locks and cylinder locks. What is a pin cylinder lock? A cylinder lock is a mechanism made up of a keyhole and a mechanism contained within a cylinder. It uses pins of varying length to prevent the lock from opening without the right key. The main advantage to a cylinder lock is that the keyed cylinder can be changed to rekey a lock without altering the boltwork hardware. Electronic cylinders are available too, commonly used in fobbed and other access control systems. Security-wise double cylinder locks are more effective than single cylinder. What is a lever lock? Lever locks are commonly available in three- and five-lever varieties.If a lock has more levers, it will also have a larger number of potential key shapes, making it a safer and more secure choice. Lever locks generally use a bitted key, and require key operation from both outside and inside. To move the locking bolt, the key needs to move each lever to a specific height. Many home insurance policies require a five-lever mortice lock as standard. Our M97 Lever Mortice Deadlock uses a seven lever lock mechanism for maximum security. What is the difference between a single cylinder lock and a double cylinder lock? Even though these two different types of locks are similar they feature a key difference. What is a single cylinder lock? A single-sided cylinder lock is one that is operated by a key from the outside, but by a thumbturn—instead of a key—from the inside. This makes it quick and simple to exit the home without a key. 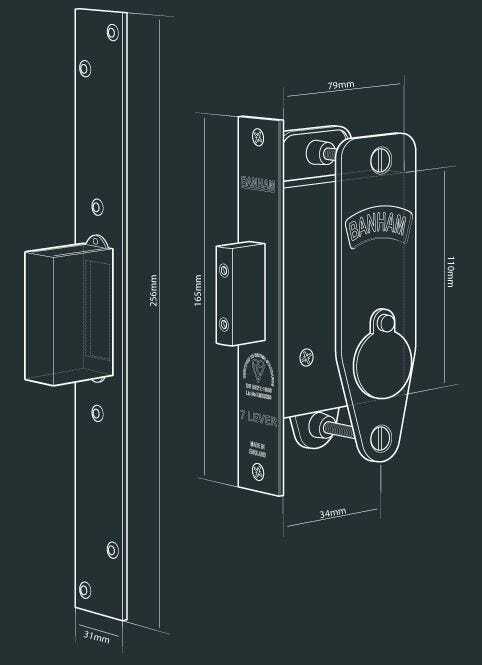 A good example of a single cylinder lock is our thumbturn-operated M5008 Cylinder Mortice Deadlock. What is a double cylinder lock? A double cylinder lock is one that is operated by a key from both the outside and inside. This eliminates the primary issue associated with thumbturns, in that a person can unlock your door if they are able to operate the thumbturn via reaching in through a window or letterbox. A double cylinder deadbolt like our G7134 door lock and G7130 with lever handle use a key cylinder on both the outside and the inside of the door. A double cylinder deadlock, like our M2002 Cylinder Mortice Deadlock is operated by a key from both the outside and the inside. Single or double cylinder deadlocks are each more suited to a given application. Likewise, there are also push-button deadbolts, which allow access using numerical codes. Deadlocks, also known as deadbolts, usually use a locking mechanism that is manually operated by the turning of a key or thumbturn. This means it requires a significant amount of force to pry the bolt back, and for this reason, they are very secure. When a deadlock is unlocked, the lock bolt is held in the withdrawn position. What types of self-locking deadbolts are there? Latchbolts are a type of self-locking deadbolt. Our thumbturn-operated BS2510 lock uses a spring-loaded bolt with an angled edge, meaning as the door is closed, the angled edge of the latchbolt retracts before springing back into a ‘locked’ position as the door aligns. The BS2510 latchbolt also has an anti-thrust snib, which deadlocks the latch once closed. The latch is easily reversible for inward or outward opening doors. Our double cylinder L2000 Rim Deadbolt is also self-deadlocking, which means closing the door automatically triggers the release of the lock bolt and secures the door in the closed position. With the L2000 Rim Deadbolt, it is possible to disable the automatic deadlocking function using the latch back button to hold the bolt in the withdrawn, or ‘unlocked’, position. For many home and business owners, security is the primary concern when it comes to choosing a door lock. So which of these door lock types is most secure? Ideally, every front door would have a deadlock. There’s a reason insurers favour deadlocks so much: they are the most difficult locks for burglars to breach. A self-locking deadbolt is another safe choice for those who value convenience as well as safety. Following insurer guidelines can be an effective way of making sure any mortice lock you buy will be effective. A five-lever mortice lock with the BSI Kitemark is often the standard. Many doors will have rim locks and mortice locks alongside their deadlocks. Finding a secure one of these is often down to a matter of investigation. While rim locks may be easily fitted and convenient for many properties, they can be less secure than mortice locks, as their locking mechanism is not buried inside the door itself. Are thumbturn locks less secure? People often worry that thumbturn locks could be less secure due to the risk of burglars reaching in through the letterbox to operate them, either with a wire or by hand. There is a simple way to alleviate this risk. Installing a letterbox protector on the inside of your door will make it impossible for burglars to reach the thumbturn. 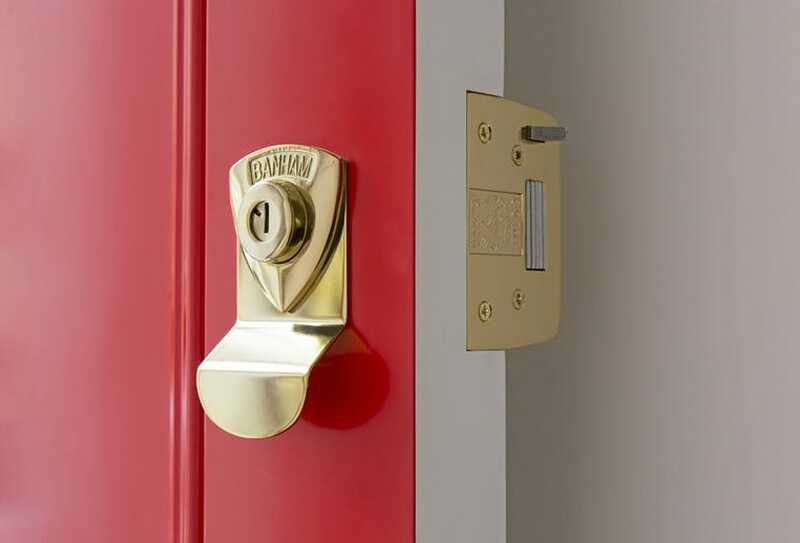 In some shared accommodation and blocks of flats, thumbturn locks are a fire safety requirement. This is because they allow residents to leave their apartments quicker in case of an emergency. 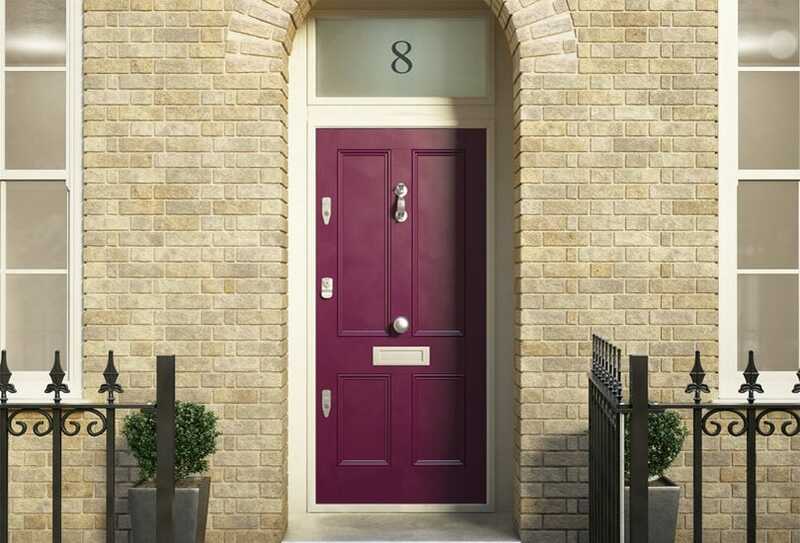 For these properties, it is still important to attach a protector when there is a letterbox, and to invest in one of the most secure thumbturn locks, like the Banham BS2510, to ensure maximum protection. Lock gradings and ratings. Locks are rated at Grades 1 to 3 based on industry standards, with Grade 1 being the safest. Locks with the BSI Kitemark (shaped like a heart) are another marker of quality. Your budget. While you cannot put a price on safety, the amount of money you have to spend on door locks will impact the right course of action. Those with larger budgets, for example, may choose between purchasing one more expensive lock, or two complementary, cheaper locks. Smart locks. Anyone looking into buying a lock will have noticed the abundance of high tech ‘smart’ locks which have appeared on the market. While these locks have their advantages (namely, convenience), most of them are untested and are not ready to be trusted as a primary form of protection. For many, the best way to judge a lock’s quality is by its brand. A reputable brand can often be a literal seal of approval. Heritage brands like Banham are backed up by decades of high quality service. Our hard-earned reputation is on the line with every lock we sell, so you can trust that we will do all we can to ensure our locks are the safest on the market. No matter which kind of lock you choose, you can be confident your home is secure with Banham. 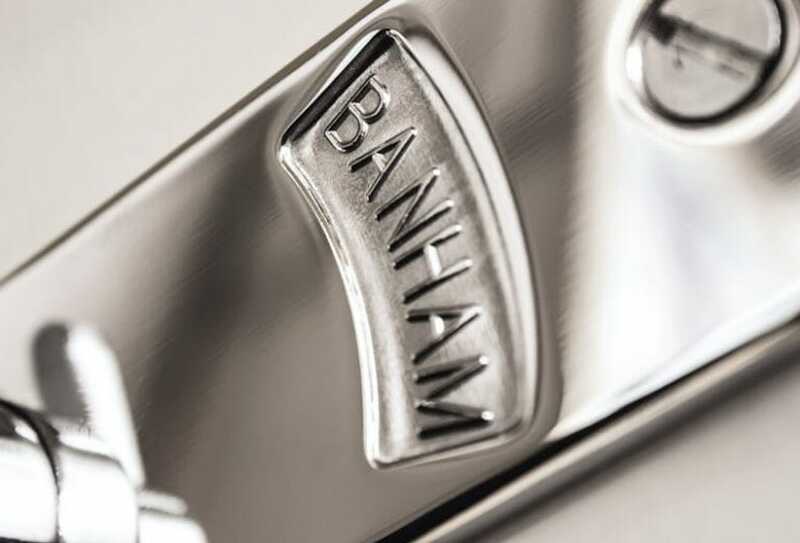 Every Banham door lock comes with the following security features as standard: saw resistant bolts; secure striker plate and our own key registration system, protected by patent and copyright. Contact our lock experts at Banham today for more information about the different types of door locks we offer, visit our showroom or book a free survey.